Master Docks closely monitors dock and lift regulation changes for the lakes we service. Below are permitting details for Lake Bowen and Lake Blalock, which includes materials and design information. 924 Square Feet. This is from an aerial view. If you have a boat slip or boat lifts those count towards the overall square footage. 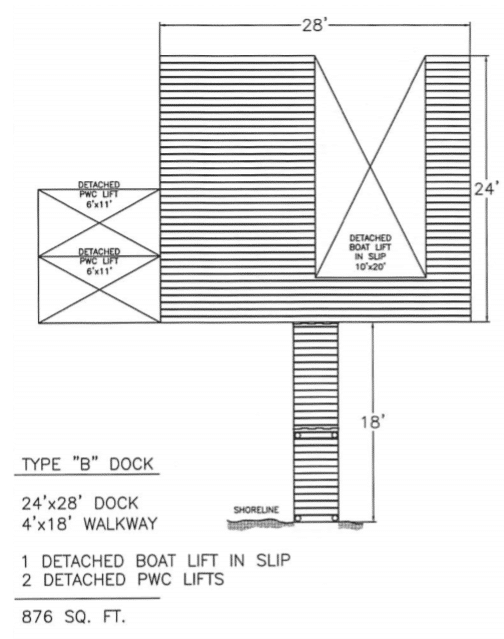 Can only have a single tie from shoreline, this means you can’t for example have a dock walkway attached to the shore and also a Jet ski lift attached to the shore. That would create 2 ties to the shoreline. 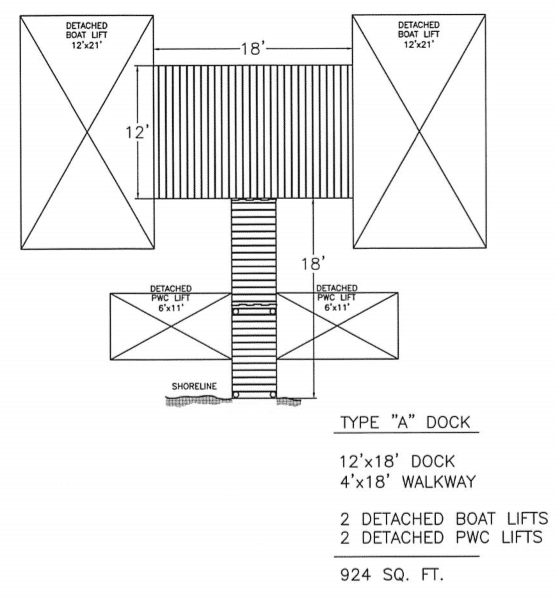 18′ walkway – 24′ x 28′ Dock with 10′ x 24′ boat slip. Roof: All roofs need to be Hunter (dark) green in color. Ongoing minor repair of any structure less than 20% of primary component or combination within one year need to be submitted to the Lake Warden office and can be approved by SWS staff. Replacement of structural components or more than 20% in one year for dock, boatlift or PWC. 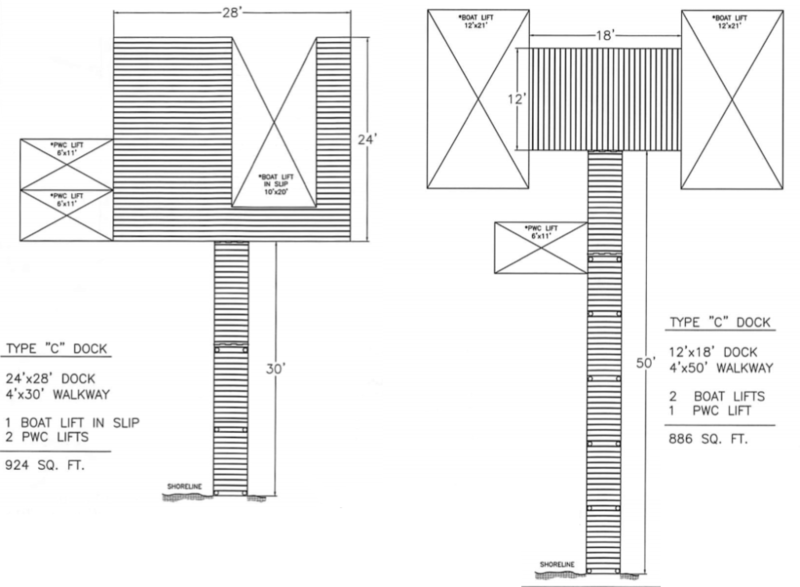 Requires that the structure meets current SWS standards and requires a South Carolina Professional Engineer stamped drawing. A permit needs to be requested at the Lake Warden Office. When emergency action is required to secure the structure in order to prevent additional property damage, safety hazards or threat to water quality. Contact the Lake Warden and approval will be granted on a case-by-case basis. 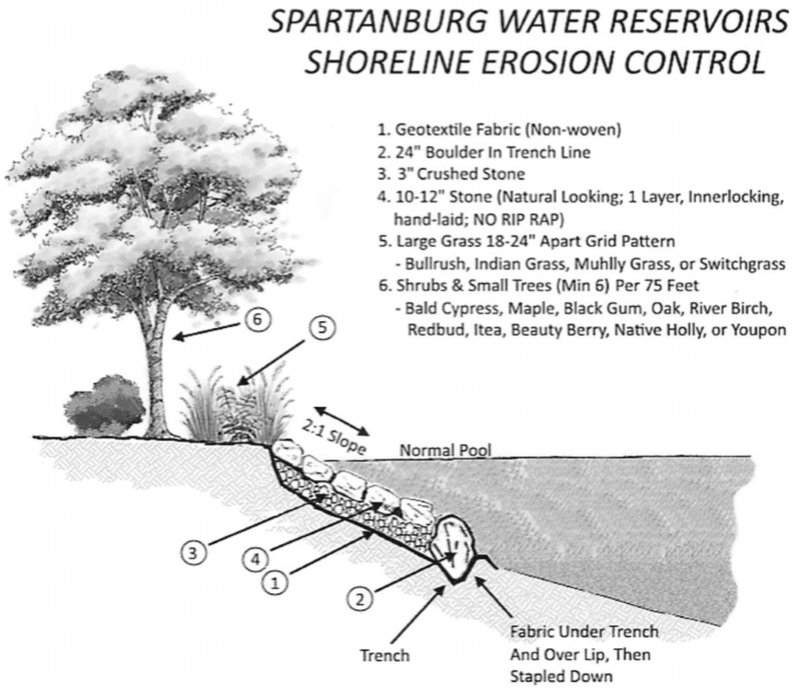 Below is an illustration what is required for shoreline erosion control. Seawalls are no longer allowed. At Master Docks we provide high quality custom aluminum and steel docks and lifts at great competitive prices for Lake Bowen and Lake Blalock. Hewitt, Floatair, Wave Port PWC & more! If you have any questions on what you can and cannot build or need maintenance repairs on your dock or lift, contact us today for help.